Provided below is a holistic overview of the key functions of a Test Environment Management . Implementation of a process similar to above will uplift your Environment IP, promote proactive management behaviour, mature your underlying operations, streamline the service and also ensure effective Infrastructure housekeeping (thus reduce/control costs). Establishment of a process to identify all Environments, Components& Relationships results in uplift in organisational knowledge and contributes to better servicing and troubleshooting of environments, resulting in streamlining of delivery tasks and higher availability. Clear and early definition of environment requirements supports proactive planning and budgeting and ensures test team has concise understanding of what applications and interfaces should be in place to support future testing activity. Accurate requirements reduce unnecessary over spend through avoiding excess configuration items and operations. Supports demand management by capturing environment requirements over time and supporting contention analysis. Contention analysis provides early insight into potential environmental obstacles and information to support more effective decision making. Cost effective environment allocation based on clear picture of Project/BAU demands. Ability to promote sharing and reuse of environments is usually cheaper than needing to build out new Physical or Virtual infrastructure. Ability to leverage mechanisms like harnessing is also cost effective when significant footprint builds are avoided. Standardized set of procedures to ensure environments implementation and applications deployments follow a consistent and repeatable (typically promotional) journey through test and ultimately onto production. Mature Configuration Management & Orchestration provides us with asset visibility, confidence that we can recreate product again and simplifies operational support activities through automation. 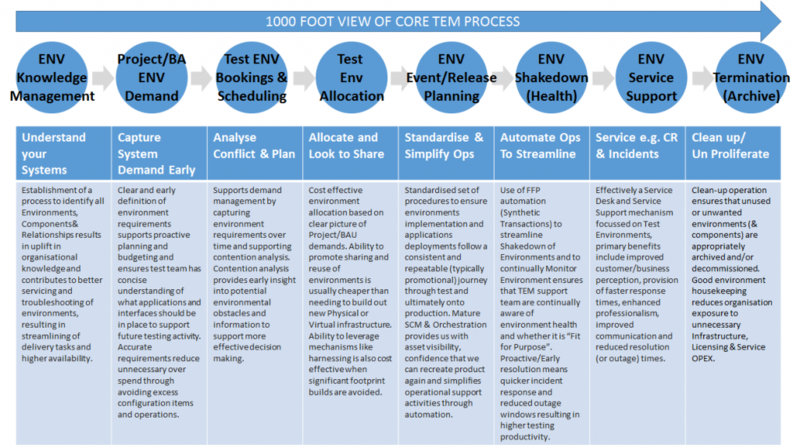 Use of Fit-For-Purpose automation (Synthetic Transactions) to streamline Shakedown of Environments and to continually Monitor Environment ensures that TEM support team are continually aware of environment health and whether it is “Fit for Purpose”. Proactive/Early resolution means quicker incident response and reduced outage windows resulting in higher testing productivity. Effectively a Service Desk and Service Support mechanism focused on Test Environments, primary benefits include improved customer/business perception, provision of faster response times, enhanced professionalism, improved communication and reduced resolution (or outage) times. Clean-up operation ensures that unused or unwanted environments (& components) are appropriately archived and/or decommissioned. Good environment housekeeping reduces organisation exposure to unnecessary Infrastructure, Licensing & Service OPEX.